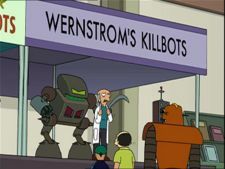 Dr. Wernstrom with his killbot. Dr. Ogden Wernstrom is Professor Farnsworth's nemesis and formerly one of his best students at Mars University in the early 2900s. Dr. Wernstrom is an old rival of Professor Farnsworth and was determined to get back at him for something as trivial as getting an A minus in an exam. His obsession with avenging himself against Farnsworth caused him to promise that he'd get back at him even if it took a hundred years. Approximately a hundred years later, he made the promise a second time (1ACV08), despite the fact that he most likely wouldn't live to be over two hundred. Wernstrom frequently sneers at Farnsworth whenever the elder scientist makes blunders. He has also been described as being a jackass (1ACV08), not just to Farnsworth, but to pretty much anybody. Wernstrom is a clever scientist, possibly the equal of Farnsworth. However, Wernstrom seems to be biased against robots, claiming that he had suspected they were responsible for global warming after this was confirmed by Farnsworth (4ACV08). Wernstrom's rivalry with Farnsworth has softened over the years and they have even worked together from time to time. After one fateful pop quiz which Farnsworth graded an A-minus on account of Wernstrom's sloppy handwriting, Wernstrom swore that he would get his revenge even if it took a hundred years. He briefly succeeded in this at the Academy of Inventors annual symposioum in 3000 when he won the Academy Prize and got to grade Farnsworth's contribution, the Smell-O-Scope concept, an A-minus-minus. However, the Academy Prize was taken away from him again after the events concerning a giant ball of garbage headed straight for New New York and his revenge was thus foiled, yet he swore he would get Farnsworth for this even if it took another hundred years. He was Mom's husband and possibly fathered Walt and Larry in the 2970s, but they divorced. They later got back together when the Professor discovered that Dark Matter could be used as a fuel. After reuniting, they broke up again sometime before the year 3000. Dr. Wernstrom is a member of the University Council of Mars University. Among other things, he is manufacturing and constructing Killbots, which brings him into competition with Professor Farnsworth once again: They got into a fist fight at the "Roboticon 3003" over it. He briefly worked for Earth's government during the global warming crisis of 3003 and attempted to kill all robots on Earth with a great electromagnetic pulse (EMP). Their rivalry appears to have softened over the years, and have even managed to collaborate with one another every once in a while, though they do periodically bicker every now and then. Wernstrom also appears to respect some of Farnsworth's decisions if he himself believes them to be right as well. Walt and Larry, possibly sons. A mirror to deflect sunlight in order to cool down Earth, later modified to deliver a massive EMP shock wave. As explained in the commentary for "Obsoletely Fabulous", Wernstrom was created as a one-time character, only appearing in "A Big Piece of Garbage", but they find him "too good" and made him reappear. He is partially based on the title character played by Peter Sellers in Dr. Strangelove, or How I Learned to Stop Worrying and Love the Bomb. He is referred to by Al Gore's head and Professor Morris Katz as "Professor Ogden Wernstrom". Poopenmeyer: Dr. Wernstrom, can you save my city? Wernstrom: Of course. But it'll cost you. First I'll need tenure. Wernstrom: And a big research grant. Wernstrom: Also, access to a lab and five graduate students, at least three of them Chinese. Poopenmeyer: Um, alright done. What's your plan? Wernstrom: What plan? I'm set for life! Au revoir, suckers! Wernstrom: It's time you left science to the 120-year-olds! Wernstrom: You've been played, Farnsworth. Played like a cheap harpsichord. Wernstrom: No-one calls me that! I'm having at you! This page was last edited on 29 September 2016, at 18:29.